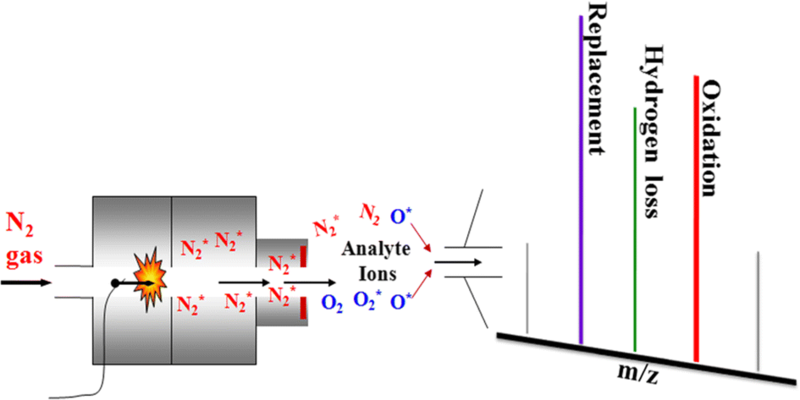 An innovative strategy for sustainably active oxygen capture using nitrogen (N2) instead of helium (He) as direct analysis in real-time (DART) gas is demonstrated in this work. DART MS was carried out to analyze different polarity compounds including organophosphorus pesticides, amino acids, hormones, and poly brominated diphenyl ethers by using He and N2 as DART gas, respectively. The unexpectedly characteristic ionization reactions, including replacement reaction where the sulfur atom of P=S group, were replaced by oxygen atom, oxidation ([M + nO + H]+ or [M + nO-H]− (n = 1, 2, 3, 4, 5)), and hydrogen loss (loss of two hydrogens) rapidly occurred in situ in the presence of N2 under ambient conditions without any additives. 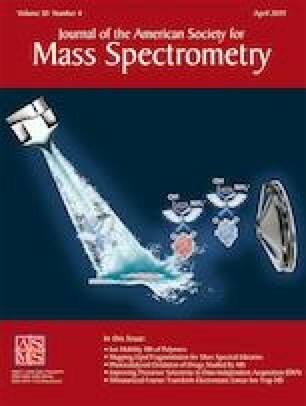 The reaction mechanisms were proposed and further confirmed by high-resolution tandem mass spectrometry. Our study under high temperature and high voltage provides a powerful tool for generating unique ionic species that may be difficult to form by other means, which also creates favorable conditions for the future study of the mechanism of DART MS. The online version of this article ( https://doi.org/10.1007/s13361-019-02132-7) contains supplementary material, which is available to authorized users. This work was supported by the Science and Technology Development Planning Project of Jilin Province (Nos. 201603080YY, 20170623026TC, 20160204027YY, 20160101220JC), Project of the Education Department of Jilin Province (No. JJKH20181274KJ), and Special Fund Project of Industrial Innovation in Jilin Province (No. 2017C056-2).